Watching seven-minutes of rolling marbles might not sound like the most entertaining thing in the world, but Ben Tardif is here to prove you wrong. 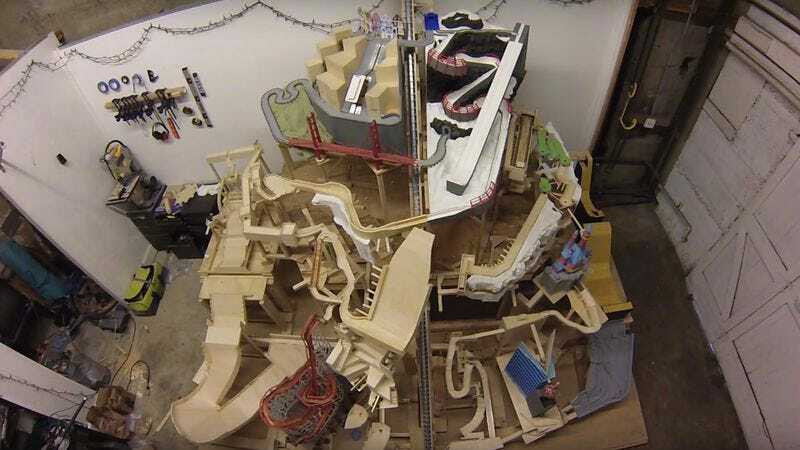 In fact, watching 300 marbles (technically ball bearings) travel through a 12-foot by 8-foot by 8-foot “Marble Mountain” is both incredibly soothing and oddly engaging. The video isn’t even set to music, but the sound of the rolling marbles accompanied by the maze’s whimsical look and some nice camerawork result in a lovely testament to engineering and design. According to the YouTube description, it took Tardif three years to get the Marble Mountain operational and the project isn’t even completed yet. Tardif’s massive design features 32 possible paths for the marbles to follow through 25 different sections themed to Tardif’s life and interests. Not everything is painted yet, but so far you can spot a roller coaster, a ski jump, the Golden Gate Bridge, the Great Wall Of China, Times Square, and a skatepark. The whole thing takes about an hour to set up or tear down and as Tardif explains, “I do know how much it cost to make thus far, but even my fiancée doesn’t know that number.” For those who want to take a closer look, Tardif documented the Mountain’s construction over on Instagram.